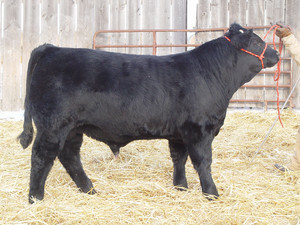 RAINSTAR is an embryo transplant son of the carcass king of the Angus breed, FUTURE DIRECTION, and the Salers breed’s most proven high marbling female, MAC BLACK FLORA 6F. His first calves born at MacDonald Ranches have an average birth weight of 76 pounds. Count on light birth weights, outstanding carcass traits and maternal excellence from this attractive son of FUTURE DIRECTION.